I have a family. Have I mentioned that? I do. I have an incredible wife named Rebecca with whom I’ve gotten to call my wife for over 6 years now. She is the source of so much of my fun and she helps keep me sane. I also have a son, a wonderful, vibrant and clever little guy, named Hutch, who is 1 year old today. Though the main point of my blog is to share different ideas and insights or media that relate to what we are studying at South Shores Remix; this important day, this milestone (more for Rebecca and I than Hutch… it’s just another day to him) I wanted to take some time to reflect on what I have learned as a father this first year. Young men, may you look forward to this time and learn from what I’ve learned… Fathers ahead of me, may you smile and enjoy thinking back on this very fun and very brief time. Labor: Now, I know as a man, this is a touchy subject. So I’ll be brief. It was hard… and I’m not talking about for Rebecca (obviously it was hard for her… light years beyond what it was for me, but I’m talking about me). It was hard for me. 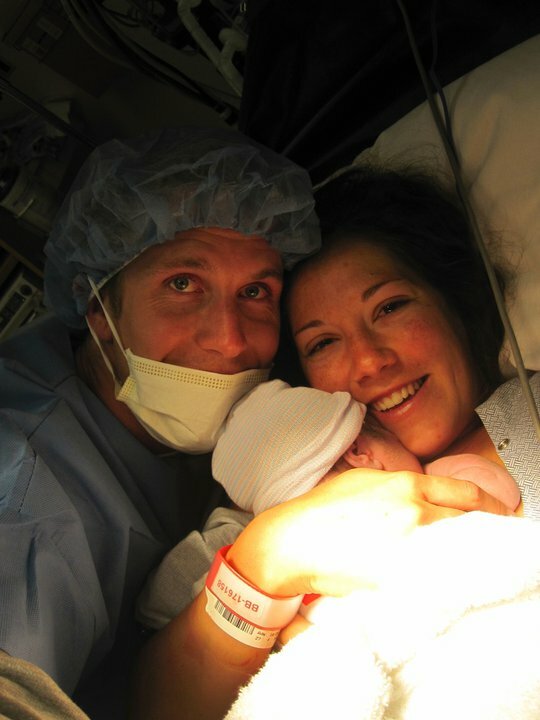 It was difficult physically – Rebecca had back labor, so I needed to be with her through each contraction rubbing her back and legs (with intensity); and emotionally – seeing the person I love more than anyone else going through this intense pain, while also worrying about and wondering about the coming of my child was incredibly draining. But relationally… it was incredible. Going through this journey of labor and delivery (see my wife’s blog for details of the story) brought Rebecca and I much closer together than I could have ever imagined… because, well, we went through it completely together. It was also a spiritual journey, the full reliance on God throughout those intense moments was absolutely necessary… and the praise after all was said and done was glorious. Future fathers: be there completely for your laboring wife in as many ways and as much as possible . Love: I think that one of the things I was most unsure of with the birth of my child was what it would be like to love someone else. Now, I already loved my parents and my brother and his family, and my friends and the poor, and the lost and the puppies and, and and… you get the idea. But very seriously, I was a little scared that because I loved my wife so much that my love for her would leave little room to truly love this little person. That all changed the moment I laid eyes on him. It is so hard to explain, but I will try: It was not simply that God gave me more love to give to this son of mine, but rather, God gave me a different kind of love that I had never experienced before – parental love, specifically, fatherly love. It is so unique and so different than any other love I had been capable of giving/having before that it still boggles my mind. It was different, it was instant, and it is strong. This is good because right away that first week there was much poop and much sleep lost because of this new little bundle – but I loved him, and would do anything for him and that is a gift of God. 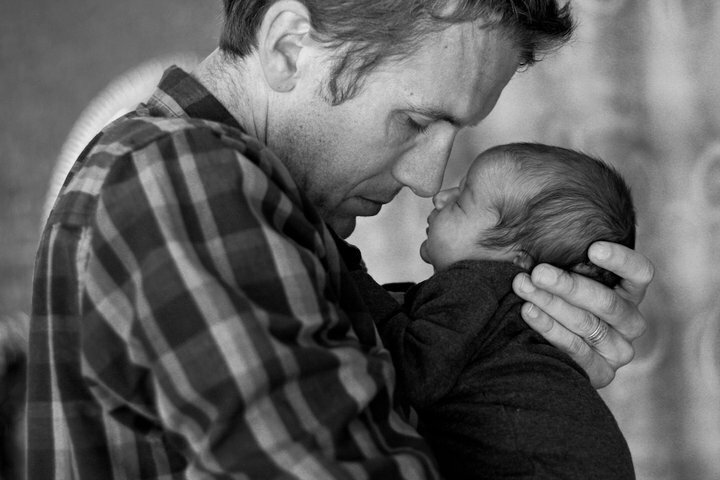 Future fathers: you may not know this love yet, but it will come. Ask God to plant it inside of you. Selfishness & Sacrifice: Marriage is a great confronter of selfishness. Someone with you each day and in your lesser moments to help you see that you aren’t as grown up as much as you have convinced everyone else you are (I’m talking about me here!). This is good and it is a gift from God in marriage. A baby, on the other hand, takes that up a few levels! “I want sleep.” “I want quiet.” “I want to eat first.” “Me, me, me…” But you can’t anymore. You can’t put off the needs of this little person who is completely dependent on you. You can’t just wait and take care of him when it feels more convenient to you. The things you want must be set aside and in doing so, you grow. You grow as a parent and a person. Already, by God’s grace, I have seen growth in myself to choose Hutch’s best over my preference, my desires… it is not easy, but it is better (and I love him!). Poopie diapers will never be fun, but each time you are more than just cleaning a smelly mess, you are learning what it means to live for someone other than yourself. 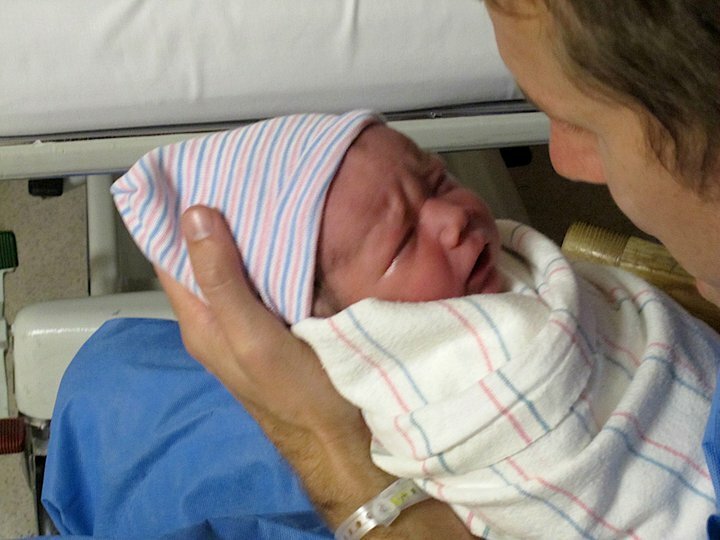 Future fathers: make a point of being the official diaper changer for the first week. 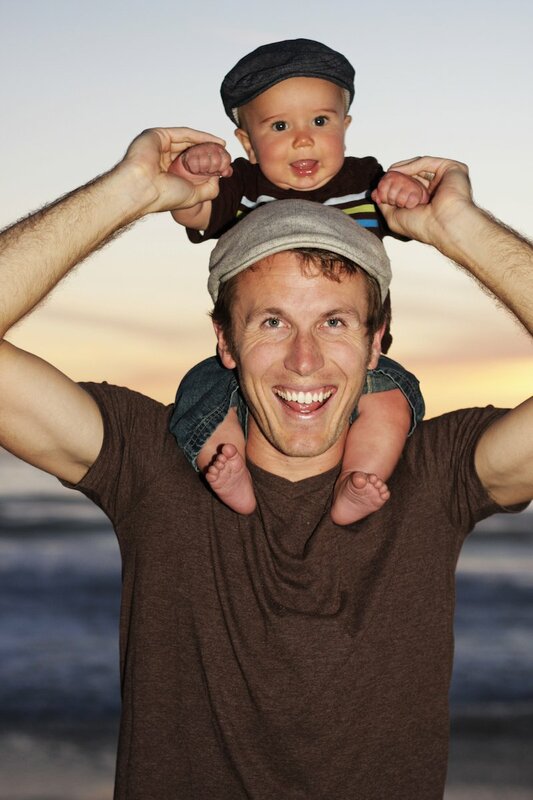 Your wife has already done a ton of work and if you don’t get good at it now, it will just be a sore spot later… I found that by being the chief diaper person for the first few weeks it also helped Hutch to learn my face and for us to bond quicker. You can do it! Fun: This year has been so much fun. Each new milestone, each developmental change, has been a joy. Sure, it’s been tiring, and the teething is no picnic… but it is all so, so worth it. One of my favorite things about being a dad is how much fun I get to have with Hutch and his mommy. We try to take a good amount of time each day and just play: be silly, chase him, dance around, tickle him, blow raspberries, play catch, throw things up in the air, throw him in the air, and so on and so forth. There are funny faces, funny noises, funny stuff all around… and he loves it. He smiles, he laughs, he shakes around with excitement and I know that he feels love. He understands that we are here for him and care for his joy too. And to repeat myself, it is so, so worth it. Future fathers: make time for fun. It helps develop their brain, develop their personality, and develop the special bond between you. God as Father. Everything I have experienced thus far with Hutch has brought me to my knees before Almighty God. Not only does it cause me to pray more (for Hutch’s safety, development, and salvation) but it has given me a new perspective, a new insight into God’s role as Father, both to Jesus and to us. That new love I mentioned before, well… it is a father’s love; and I know that because of it already I would do anything to protect this little one because he is my son. But God so loved the world that He sent His one and only Son… to die for us… so that whoever would believe in Him would not perish, but have eternal life. This is an astounding truth, that God as Father could really send His Son to pay that price in place of us wretched sinners. Wow. We should be speechless, we should be in awe. But the awe doesn’t stop there, because the God that sent His Son to pay the ultimate price for us, didn’t just save us to be made alive or clean, but to dwell with Him as His fully-adopted sons and daughters. We now are the recipients of His great and unique Fatherly love (perfect in every way). Praise God for that love. It is a love that will never fail. Future fathers: if you do not know this love, if you do not know this God, please let me help you to know Him. He loves you greater than you can ever love your own children and He will help you to love your children even better. Hutch Wilder Zeulner: I am so thankful for you. I love you. Happy Birthday! I first just have to say that last night was awesome. Everything about it, just wowed me. The people, the worship, the response of many people choosing to stick around and get to know other people (just like I hoped they would! )… it was all sooo good. My board notes are very similar to last week, I simply added a little bit to last weeks. In all fairness my board notes were simply to help clarify and review the last half of chapter two because it is the foundation of the first half of chapter 3. Feel free to share any of your own notes if something stuck out as important to you (I’d love some comments!). Apart from God we are, in fact, dead. Unfortunately it seems that we get the idea that simply because people are walking around, doing business, eating, drinking and seemingly living life that we are in fact alive. Yet, here our experience is an illusion compared to the biblical truth. Beating hearts and breathing lungs are no comparison to being spiritually alive. Paul can say, “As for you, you were dead,” and it is a true claim about each and every person. Our death is complete. There is no self-revival, no self-resuscitation. Paul shows us that the only thing that dead people do is stay enslaved to the world, the devil, and the flesh (our natural, sinful desires). Dead people do not get alive of their own merit, their own charm, their smarts or good looks… the dead stay dead… destined for the judgement and wrath of a holy God that does not associate with spiritually dead slaves. But God. In our desperation, in our destitution, unable to do anything to save ourselves, God moves. This is the Gospel (good news): that despite our wretchedness, God acts in order to make us alive. Why? His love, His mercy, His grace, His kindness… God moves to save us because God wants to. Praise God! We were made alive to live. This seems like a silly statement, but it is gospel truth, and one we fail to realize (or at least to put into practice). We have been made alive, we have been raised with Christ and seated in the heavenly places. The world is no longer our home… so its sin should not be ours. The devil is no longer the ruler of our domain, but Jesus Christ is our King… so we live under His rule. And our flesh having died with Christ is no longer our most powerful force within us, but the Spirit who dwells in us. Do not climb back into the grave! Live! We are His trophies. Now, I don’t know about you, but I wouldn’t make a trophy in my own likeness, let alone actually use me as a trophy. It doesn’t seem like there would be much honor to bestow with that. But God thinks differently than I. He tells me that I am a trophy, of His mighty power to convert a dead rebel into a living son, and of His grace because I deserved none of it. Thereby, my very existence now points to God, points to His rich and incredible grace. God. Not you. Just in case you forgot… Paul makes it very clear in verses 8-10, that your new life is not your doing… but the God who is generous beyond anything we can comprehend. But Christ. He took those far away and brought them near. Just not in the way that they thought… it was not for a new way of converting people to Judaism, but to create a new man, a new race of people united in Christ and united to God by Christ. This trumped everything people had been expecting… and is the wonderful new truth we get to live in. We were not just made alive, we were not just saved, but we were saved into a people! A people with a new way to relate to God and a new purpose. We are new. New citizens of God’s Kingdom, new family members of God’s household, and new stones being added together to make up a temple where God dwells. Again, When God saves he doesn’t just get rid of the bad of before, He takes us into SO MUCH BETTER. An existence with full equality and unity and purpose; not to mention the promise of an existence intimately connected to God’s presence. God gives. God is a giver, a saver, a planner, a doer, a maker of people and a breaker of walls. All out of his own generosity and for His own glory. Praise Him. 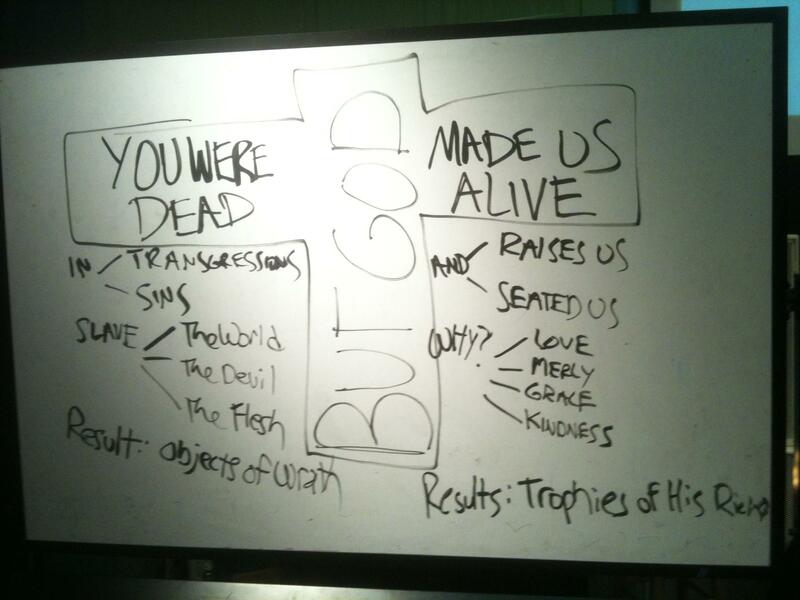 Here are my board notes from Sunday night as best I remember it (didn’t take a picture this time). I think it is very important for Christians to be able to bust out a rudimentary timeline of important Biblical events and figures at a moments notice. Why? 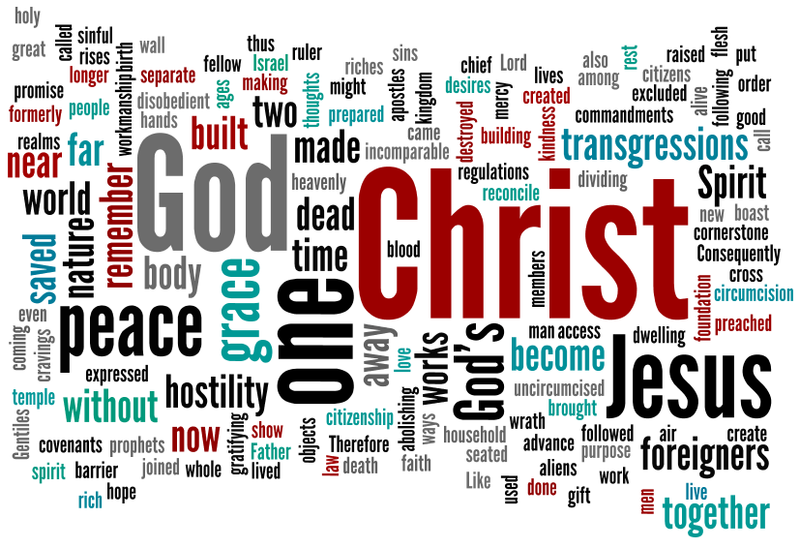 It helps us understand the unfolding plan of God in history that leads up to Christ. 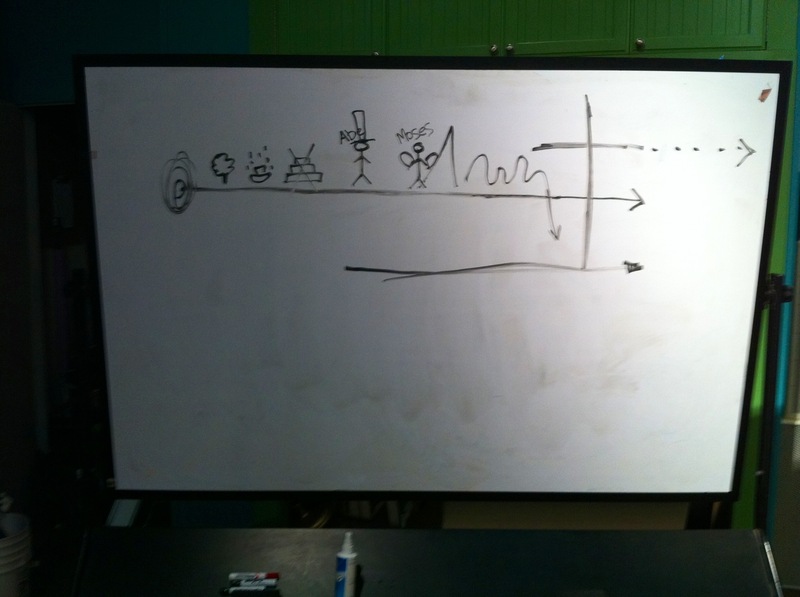 Notice, I didn’t include everything in this drawing, but just hit the big points (listen to the sermon!). What is missing from this drawing? The cross… Listen to the sermon and see that it is the work of Christ on the cross that abolishes the old covenantal law which had become a barrier between Jews and Gentiles, and between all men and God (because we simply couldn’t do it!). Here is the actual board... finished product.